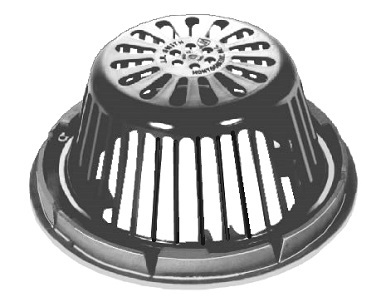 PRODUCT: SMITH #1001, Universal Drain Dome AND Collar Assembly Set. Polyethylene "Twist Type Locking" Dome and Duco Coated Universal Cast Iron Collar. Price/Set. DESCRIPTION: Universal cast iron membrane clamping collar and dome are designed for retrofit roof applications where the existing main roof drain body is to remain in place and continue to be operative. The bolting lugs of this collar match the bolt pattern of the majority of the common roof drain bodies and generally conform to the surface angles of the flange. This allows easy replacement along with adequate pressure on the membrane to insure water tightness. The collar is designed to accompany most 15" and 16" diameter roof drain bodies with bolt circles ranging 7 1/4" to 10 3/4" in diameter.